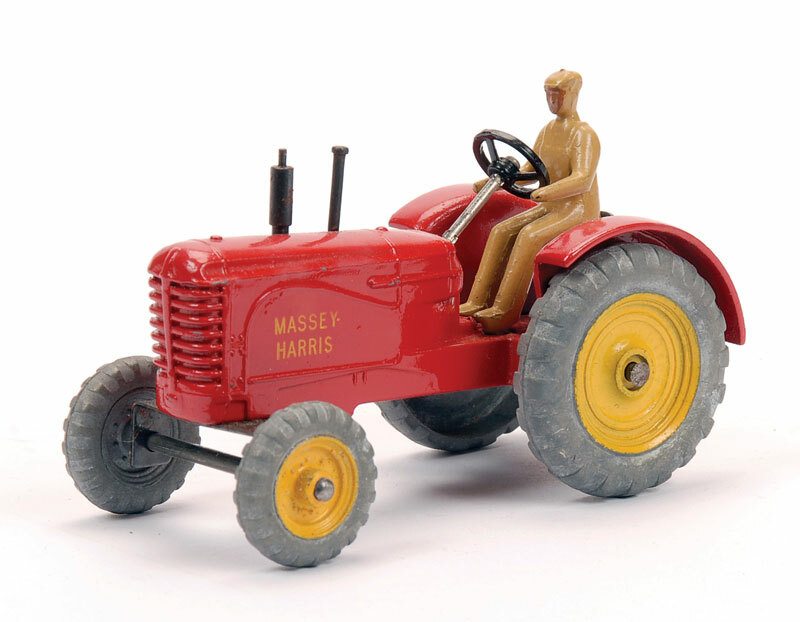 It is well known that the Massey-Harris/Massey-Ferguson tractor acquired rubber tyres and a plastic driver later in its production. I have noted that the changes did not happen all at once. I apologize for most of the tyres being on the wrong way but that is how they were found. Firstly there was the standard #300 with metal wheels etc. There are some variations with the base finish, but this is not the subject here. The first change came with the wheel and tyres being changed. This example has the wrong front tyres and the 'Massey-Harris' stenciling has rubbed off. the driver's seat is pressed metal. I also have one fitted with a metal driver that may not be original but it seems firmly fitted to the casting. The last change I think is the exhaust pipe is replaced with a plastic one - easily lost! Unpainted steering wheel. And one fitted with green wheels from the Field Marshall tractor! The signs seem to be stenciled and not a label. 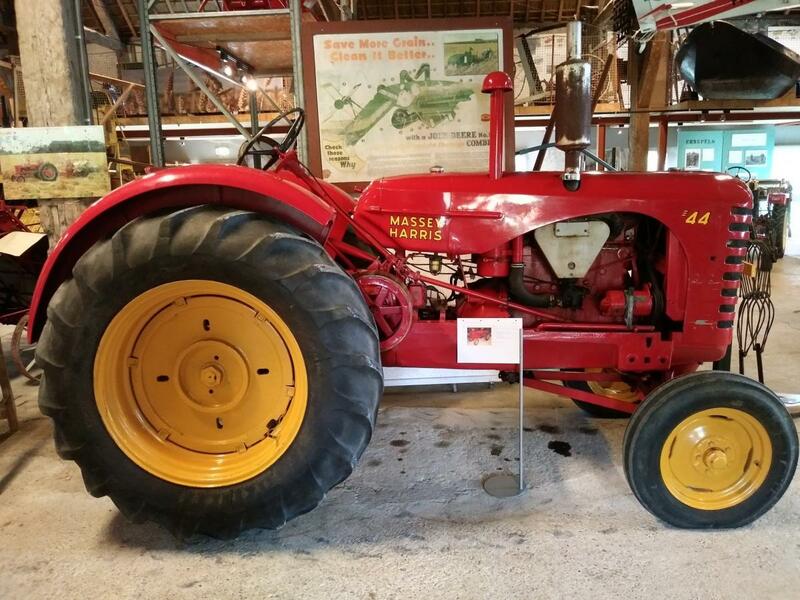 Nice compilation on variations of the 300 Massey Harris/Ferguson Tractor! There seems to be a South African issue as well, without any labelling. My green wheel Tractor has a black exhaust. The South African issue is with or without tampoo marking "DIESEL HARRIS". There are at least eight variations of the model plus the S.A. one, six trade boxes and eight individual end flaps boxes. 1 - Diecast hubs and tyres, diecast driver painted beige, tin plate driver's seat, spun exhaust, marked Massey Harris by tampoo. 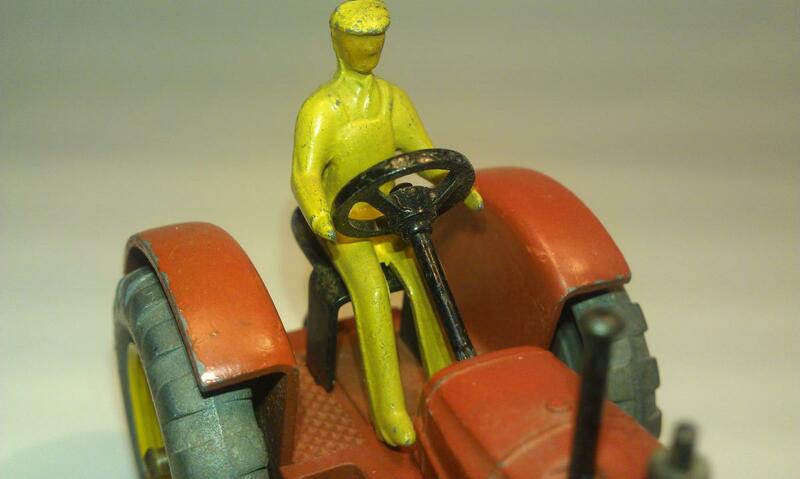 2 - Rubber tyres, diecast driver painted beige, tin plate driver's seat, spun exhaust, marked Massey Harris by tampoo. 3 - Rubber tyres, blue plastic driver, tin plate driver's seat, spun exhaust, marked Massey Harris by tampoo. 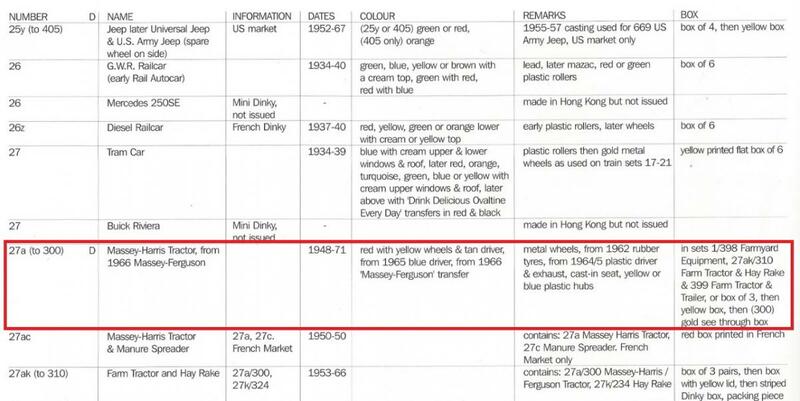 4 - Rubber tyres, blue plastic driver, diecast driver's seat, spun exhaust, marked Massey Harris by tampoo. 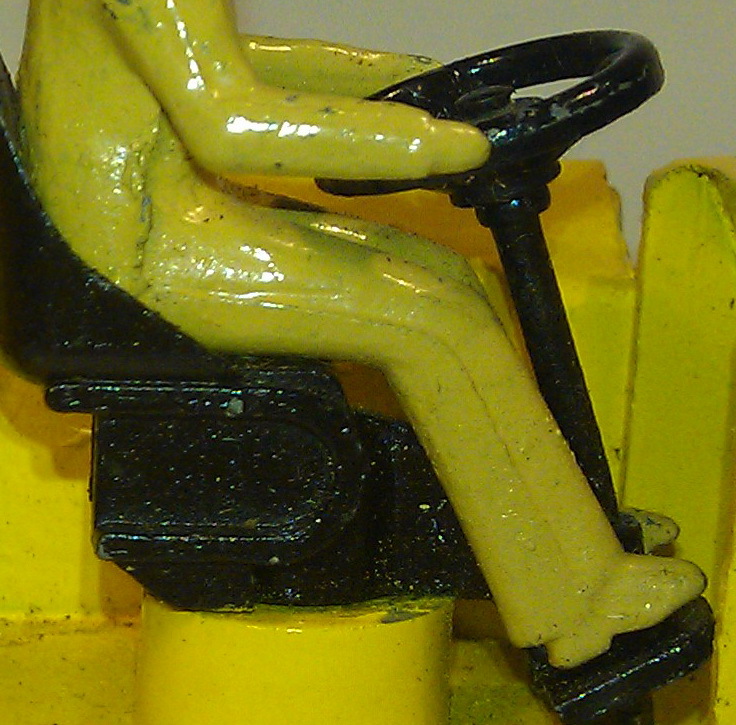 5 - Yellow hubs, rubber tyres, blue plastic driver , diecast driver's seat, spun exhaust, marked Massey Ferguson by tampoo. 6 - Green hubs, rubber tyres, blue plastic driver , diecast driver's seat, spun or yellow plastic exhaust, marked Massey Ferguson by tampoo. Rare issue. 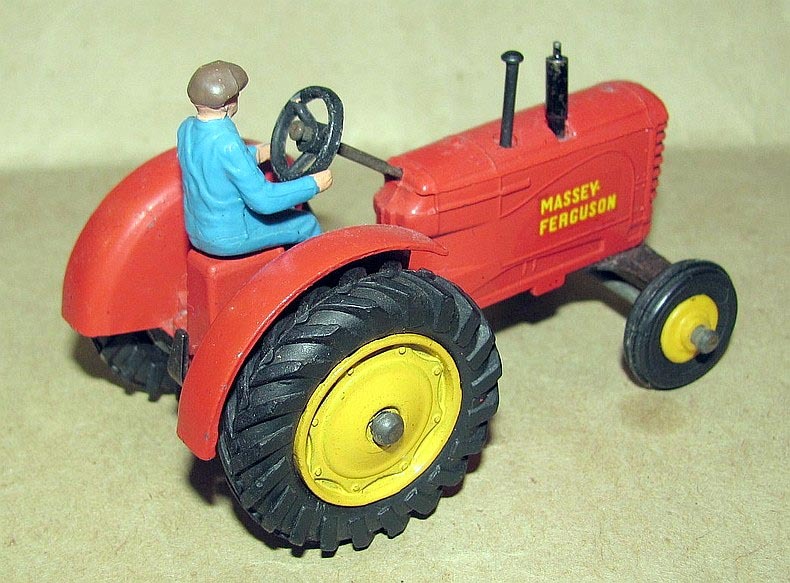 7 - Rubber tyres, blue plastic driver , diecast driver's seat, yellow exhaust, marked Massey Ferguson by tampoo. 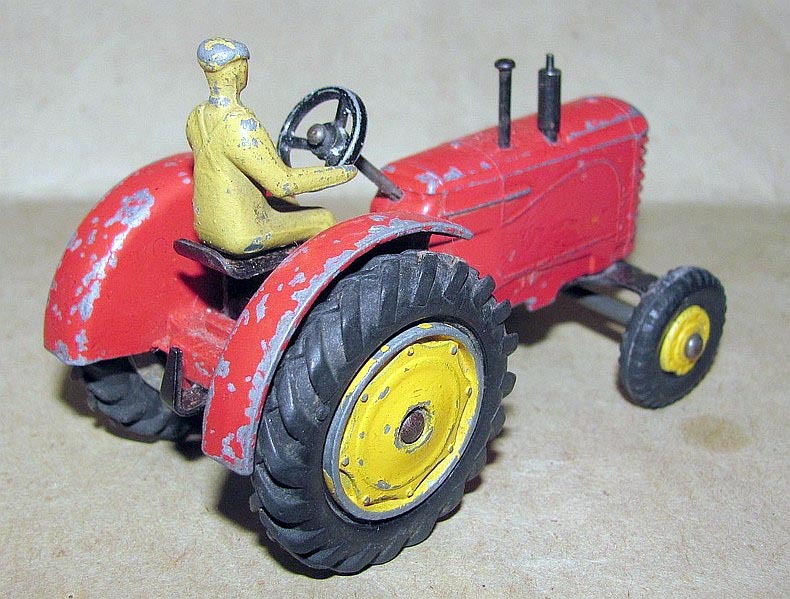 8 - Rubber tyres, blue plastic driver , diecast driver's seat, yellow exhaust, unpainted steering wheel, marked Massey Ferguson by tampoo. 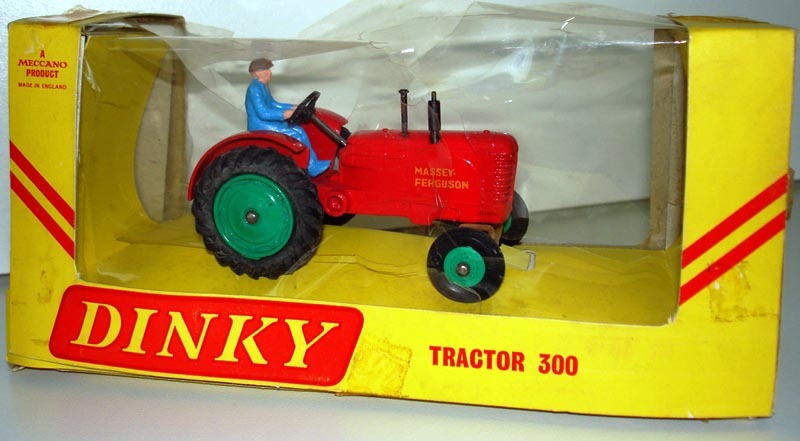 “To mark the 75th anniversary of Dinky Toys, North Yorkshire tractor enthusiasts have created the ultimate homage – full-size replicas of two of their models, complete with display boxes. They go on public display for the first time at Newby Hall’s tractor rally on Saturday 6 and Sunday 7 June 2009. 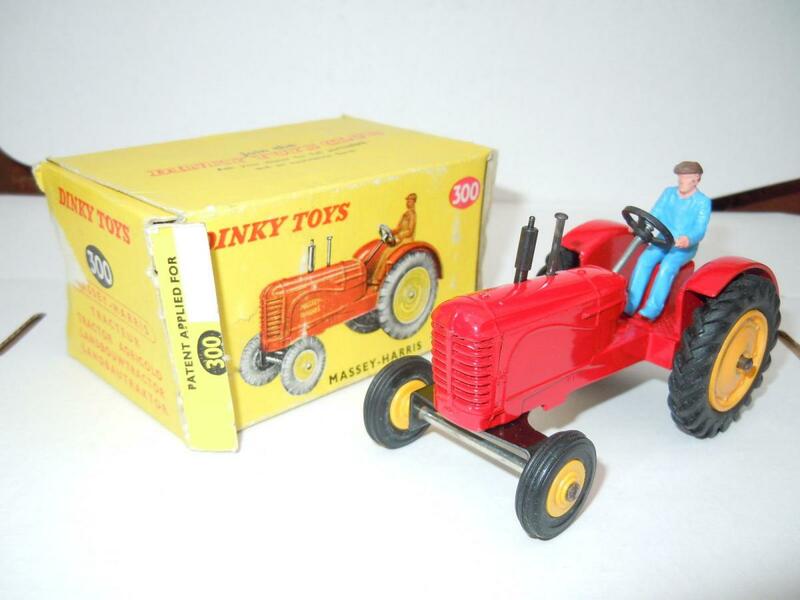 Peter Dean of Galphay, near Ripon, created a display box for his 1950 Massey Harris 744 tractor, a full-size version of the Dinky toy version, right down to the colour of the packaging. The size of a single domestic garage, the display box is made of wood and painted in the same style as the original Dinky version, owned by fellow enthusiast – and the man behind the idea – Maurice Craven. 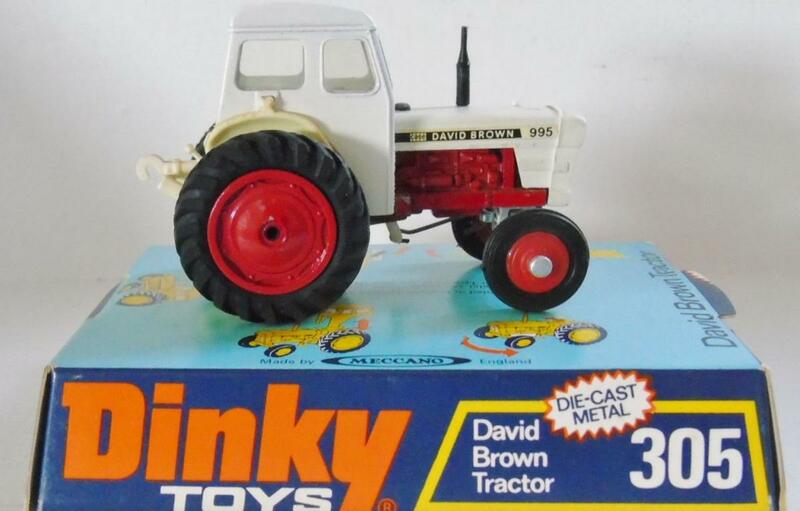 “People will think we’re mad for trying to do this, but with 2009 being the 75th anniversary of Dinky Toys, there has never been a better time to recreate the Dinky model at actual size,” says Maurice. 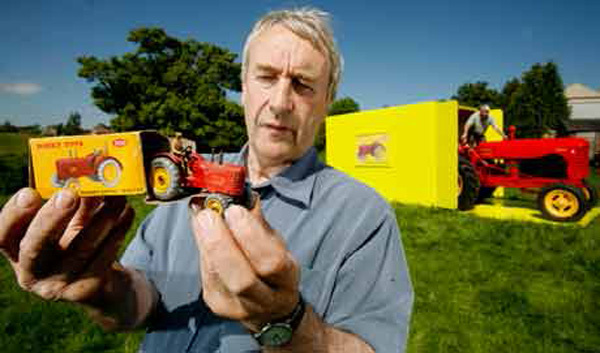 It took several weekends for Peter – a joiner by trade – and his son, Mark Dean, to build the boxes and paint them in the Dinky style. I just had a good look at the version with the metal driver and pillar seat and decided it should be disqualified as the spigot on the left foot has been removed as there is no hole in the deck and so is glued in place. I have a question that has been keeping me busy for a long time. 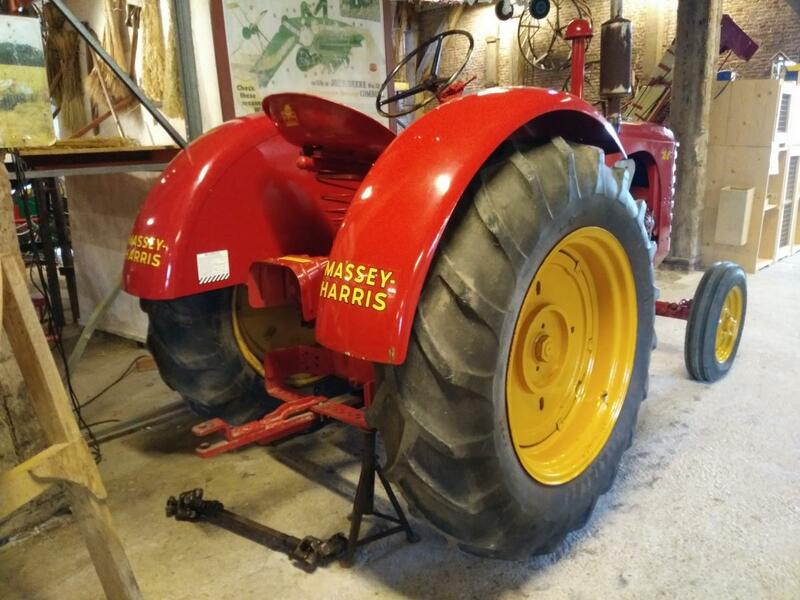 Are there differences to be found between the earliest 27a Massey Harris Tractor compared to the later 300 Massey Harris? I mean the 1st versions with metal wheels and Tan cast driver on a split metal chair. There has never been a model number on the base. Is it true that I find that all early Massey Harris tractors have a black metal steering stem and the later editions have a blanc bare metal steering stem? Is it correct that the driver of early models is clearly different from the later drivers? I see that the cap and the coloring of the head of both models are different. When does that changed? Can anyone say more about this? Is there a drawing that can explain something? 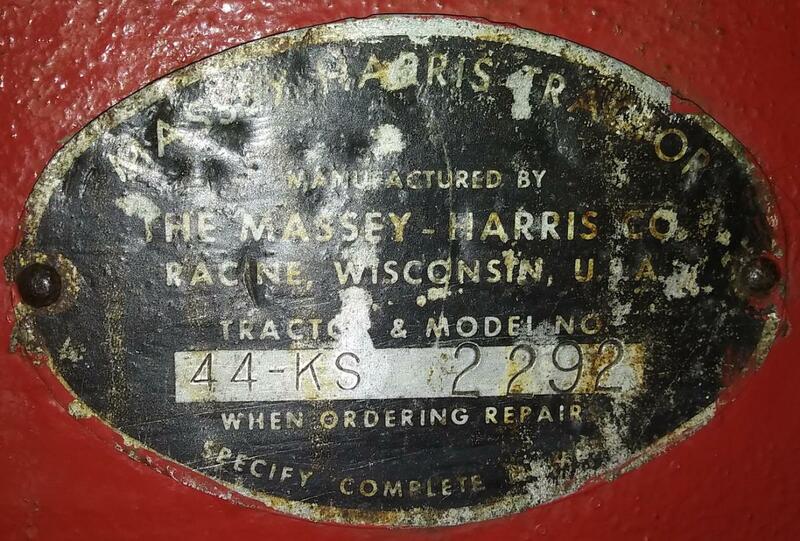 I am excited that I have found several differences between the earliest Massey Harris tractor 27a and the later ones. I discovered casting variations that not yet have been discussed before in TMT, DTCA or elsewhere. I'm curious if they are known by other members and or someone also has this 1st version, maybe without knowing it. I hope to receive some reactions about that. 1. Colour steering wheel rod: early - black; Later - blanc. 2. 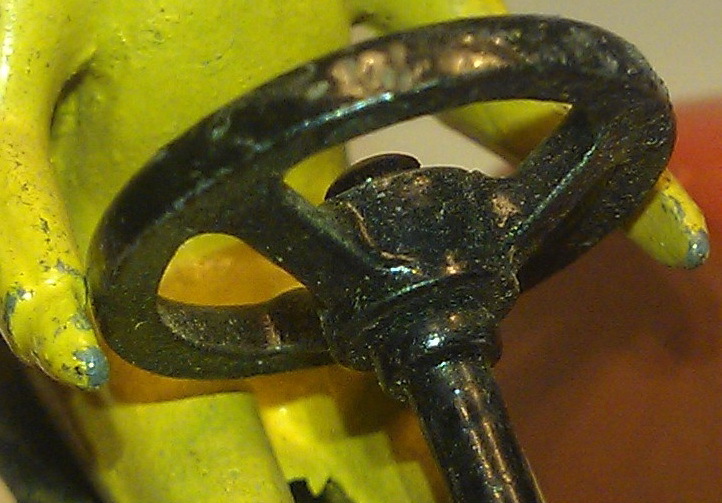 Steering wheel mounting on steering rod: Early - with (extra) coupling underside steering wheel; Later - without coupling. 3. Strengthening rear platform: early - without strengthening; later - with strengthening. 4. Fastening driver to the underside of his seat: A) with rivet. B) with a sort of plug? 5. 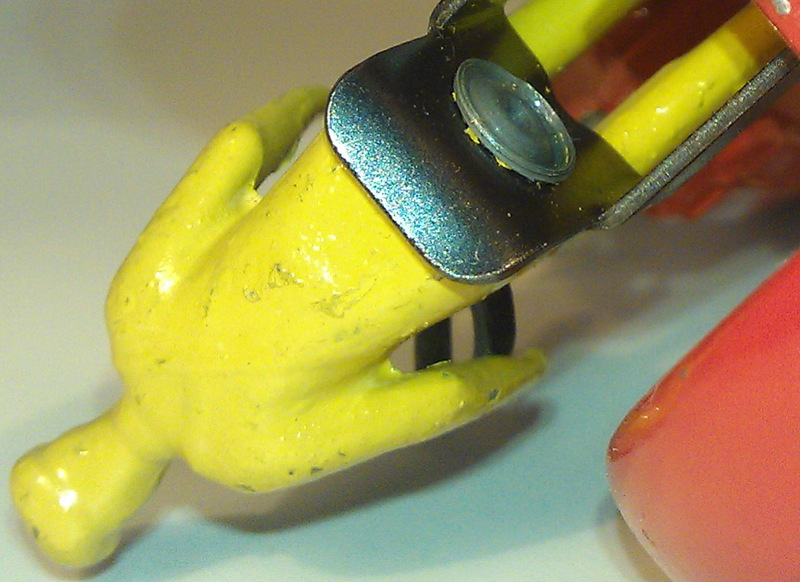 Towing Hook: early – small; later - large hook. 6. Hubs inside rear cast wheels: early small; later large hubs. 7. 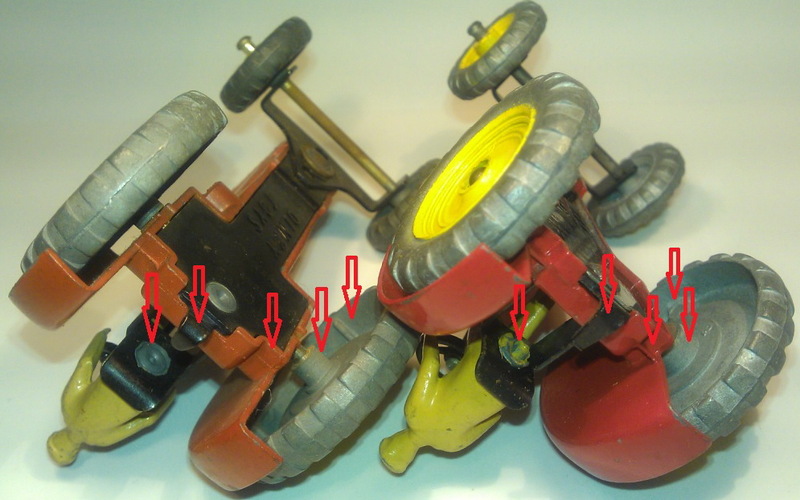 Strengthening inside cast rear wheels: early - 4x narrow upright; later - 3x flat wide. In the meantime I searched and found an answer at my question in my contribution above, about my thoughts about the colour of the steering wheel rod of the earliest MH tractor. I found confirmation of my findings in the job list in the GBDT page 178 (see picture): The steering-wheel assembly of the Dumper truck and Farm tractor are equal (2-1-1948). Although the steering rod is not mentioned in this, I assume that the steering rod is an essential part of the steering wheel and included in the assembly of the steering wheel. 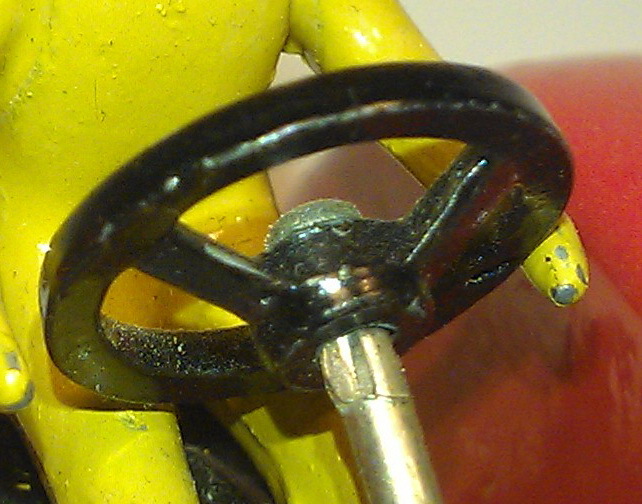 The steering wheel and the steering rod of the 562 Dumper Truck are completely black (see picture). 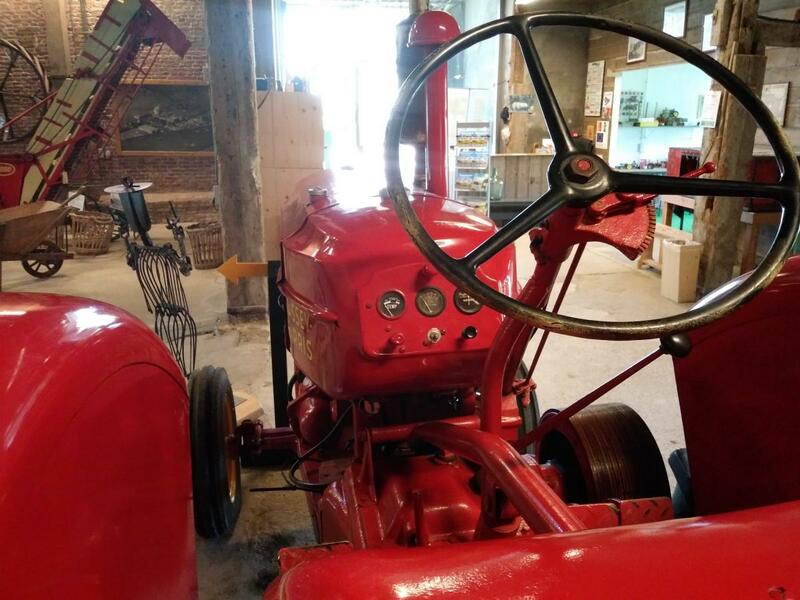 That’s why the earliest version of the 27a Massey Harris Tractor the steering wheel and the steering rod, according Job No 12989, are also completely black. 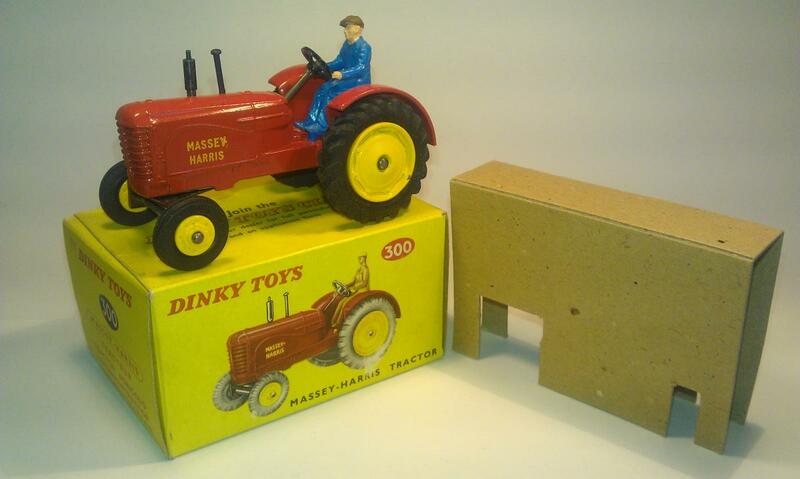 This is the only box I have of the Massey Harris Tractor. Several boxes have been issued, which I leave to others. In this contribution I have shown how easy to recognise a first edition of the 27a Massey Harris. Jacques, are these information’s something for your encyclopaedia? Thank you for the information in your post above, I was not aware of the variation in the driver's bottom. Which is the earliest one ? Split stud or spun / riveted ? There is still a lot to find out about these tractors as there are many variations and a list of the at least twelve different variations has still to be written. The 27a and the 300 are different models. The 27a is stamped MASSEY HARRIS and the 300 is stamped MASSEY FERGUSON. Are there any 27a with tubber tyres ? Some of the 300 had no MASSEY FERGUSON stamping. Factory errors ? There were many boxes, mainly trade boxes for the 27a, at least six different ones and I know only one yellow box with the double numbering. I do not know of a yellow box with only 27a. I think that none has been made because thre was a double numbered trade box. The 300 issued in 1954 had at least seven different boxes all with the reference 300. The double reference yellow boxes were for the 27a. Every one is welcomed to give a complete description of the models in their collection so that a list of the variations can be made. Below is my list of variations for the 300. 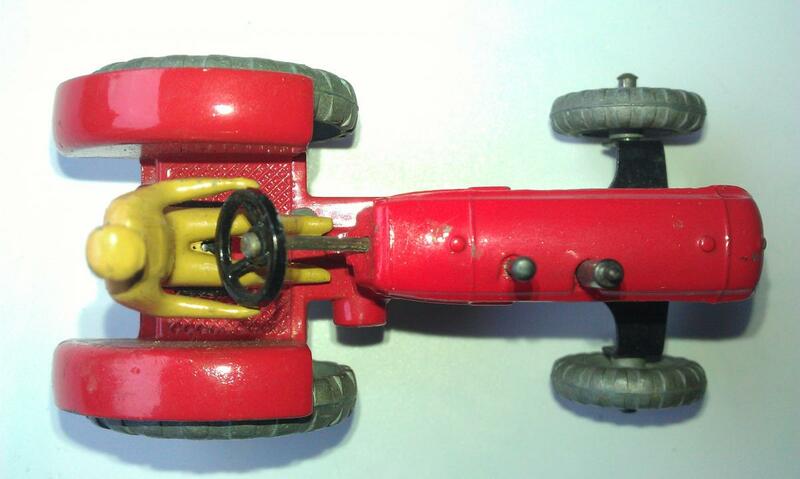 1 • Diecast hubs and tyres, diecast driver painted beige, tin plate driver's seat, black steering wheel, blanc steering column, spun exhaust, marked Massey Harris by tampoo. 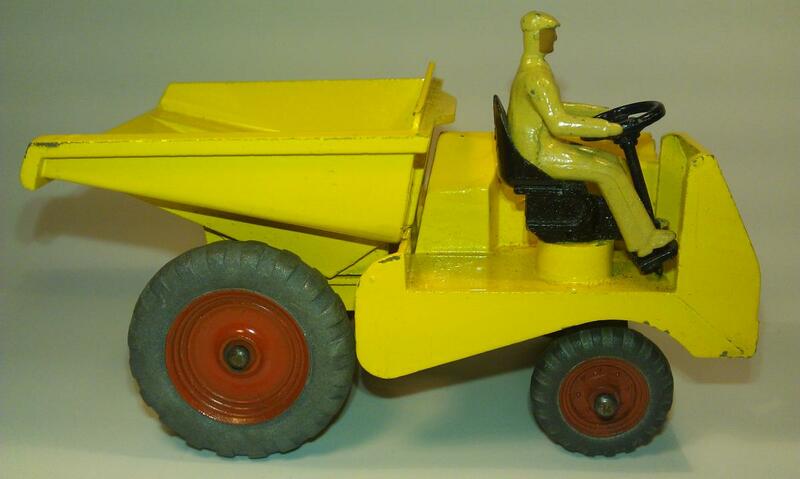 2 • Yellow plastic front hubs, rubber tyres, diecast driver painted beige, tin plate driver's seatt, black steering wheel, blanc steering column, spun exhaust, marked Massey Harris by tampoo. 3 • Yellow plastic front hubs, rubber tyres, blue plastic driver, tin plate driver's seatt, black steering wheel, blanc steering column, spun exhaust, marked Massey Harris by tampoo. 4 • Yellow plastic front hubs, rubber tyres, blue plastic driver, diecast driver's seatt, black steering wheel, blanc steering column, spun exhaust, marked Massey Harris by tampoo. 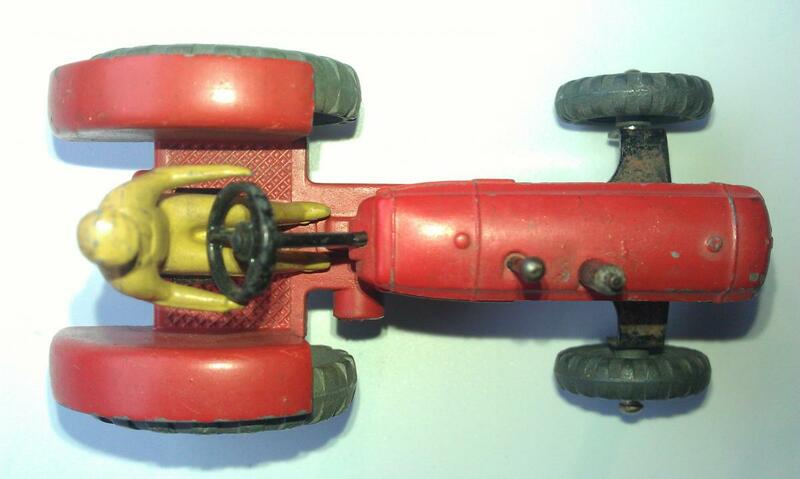 5 • Yellow plastic front hubs, rubber tyres, blue plastic driver , diecast driver's seatt, black steering wheel, blanc steering column, spun exhaust, marked Massey Ferguson by tampoo. 6 • Green hubs, rubber tyres, blue plastic driver , diecast driver's seat, spun or yellow plastic exhaust, marked Massey Ferguson by tampoo. Rare issue. 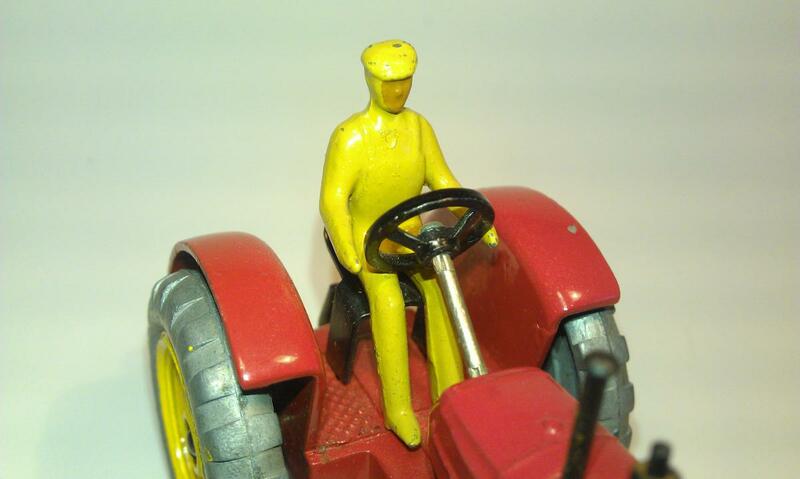 7 • Yellow plastic front hubs, rubber tyres, blue plastic driver , diecast driver's seatt, black steering wheel, blanc steering column, yellow exhaust, marked Massey Ferguson by tampoo. 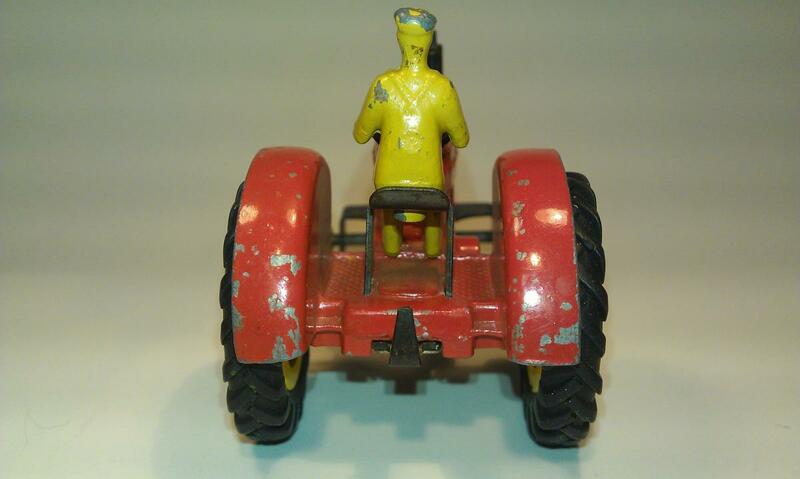 8 • Yellow plastic front hubs, rubber tyres, blue plastic driver , diecast driver's seat, yellow exhaust, unpainted steering wheel and steering column, marked Massey Ferguson by tampoo. 9 • Yellow plastic front hubs, rubber tyres, blue plastic driver , diecast driver's seat, yellow exhaust, black steering wheel, unpainted steering column, with or without Diesel Harris marking by tampoo, special South African yellow box. Rare South African issue. Jacques. Of my 1st version, the driver is fastened to his chair with a rivet. I have 3 MH's. Of those other 2 later versions of mine, one driver is also fastened with a rivet and the other is fixed with the other method, but I do not know the order of production of that 2. 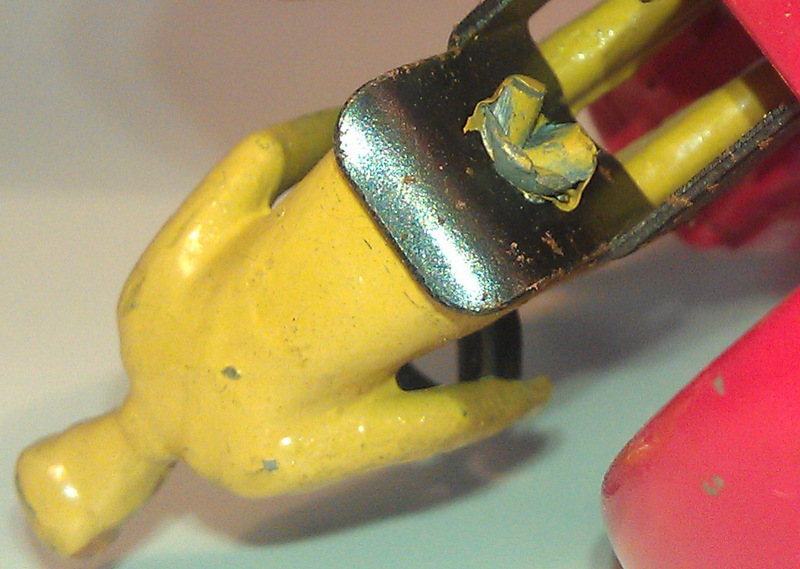 Apparently drivers were in the beginning of the production fastened with a rivet and later on with that other method. Details 27a in GBDT page 38. (At the end in full size). 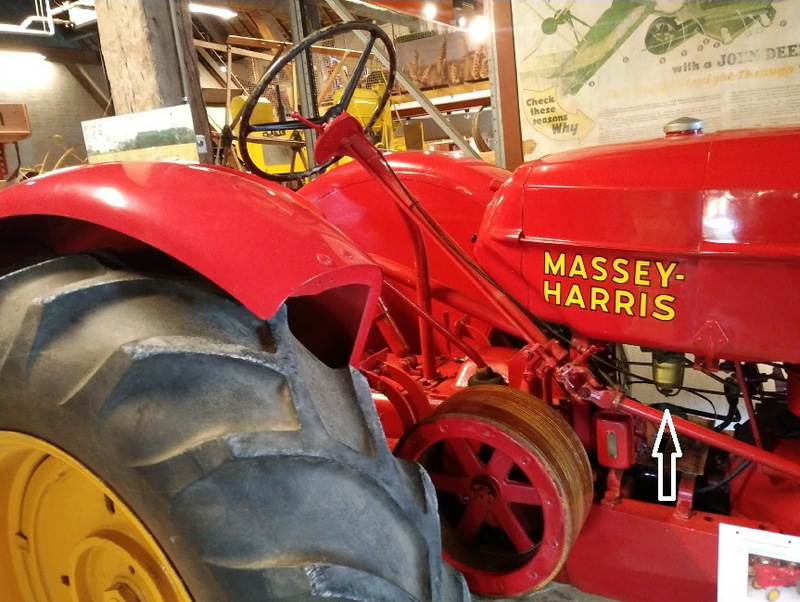 According to GBDT p. 38, the Massey-Harris tractor brand name changed to Massey-Ferguson in 1966. This only concerned the brand name indication on the DT models. In practice the merger of Massey-Harris with Ferguson took already place in 1953 and continued under the name Massey-Harris-Ferguson. 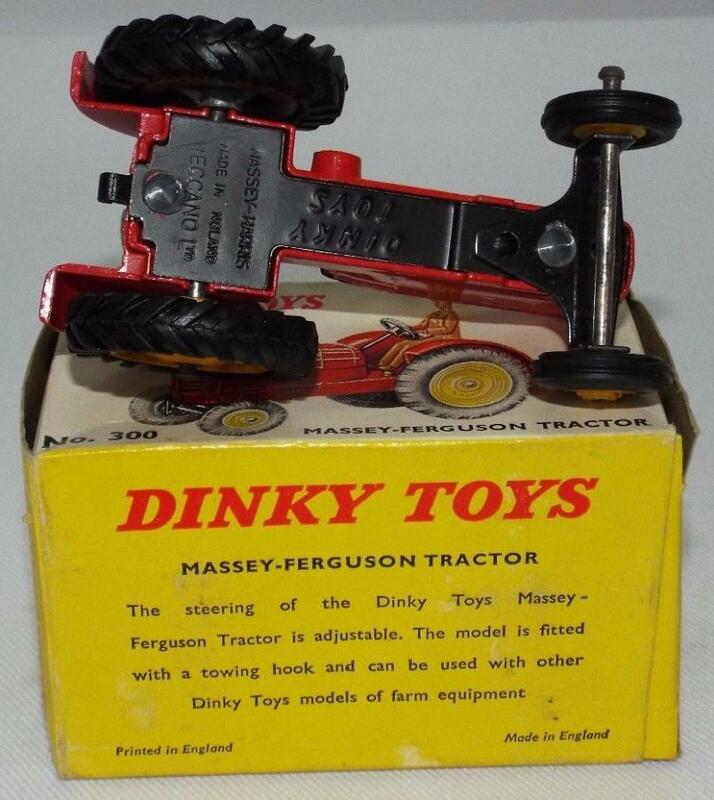 It was not until 1958 that they changed to the current name Massey-Ferguson, but the brand name change on the DT models was not until 1966 carried out by Meccano Liverpool. 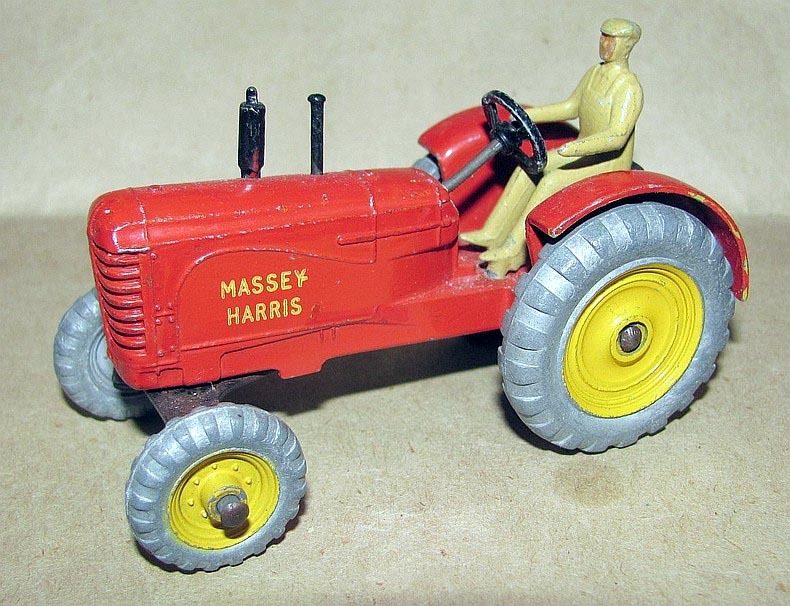 In the catalogues the brand name Massey-Harris tractor appeared for the first time in 1948 and was last seen in the catalogue of 1963. 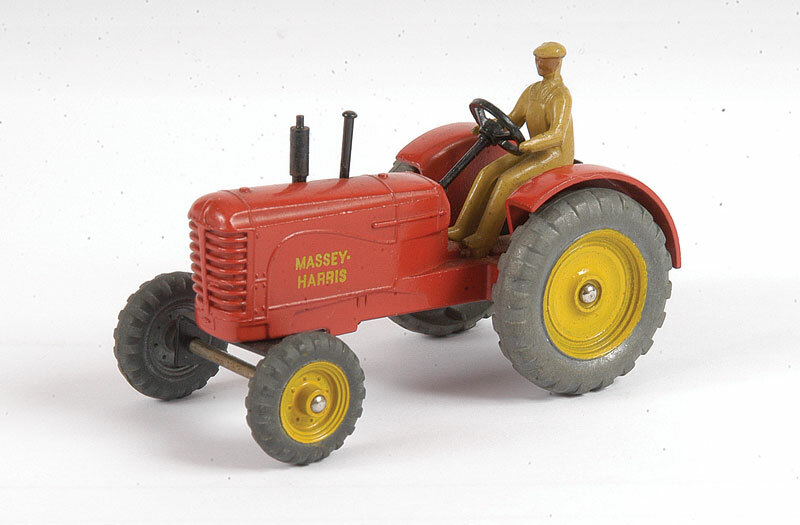 In 1964 and 1965 the Massey Harris tractors were pictured in the catalogues with caption Massey Harris tractor, but without a brand name on the model. 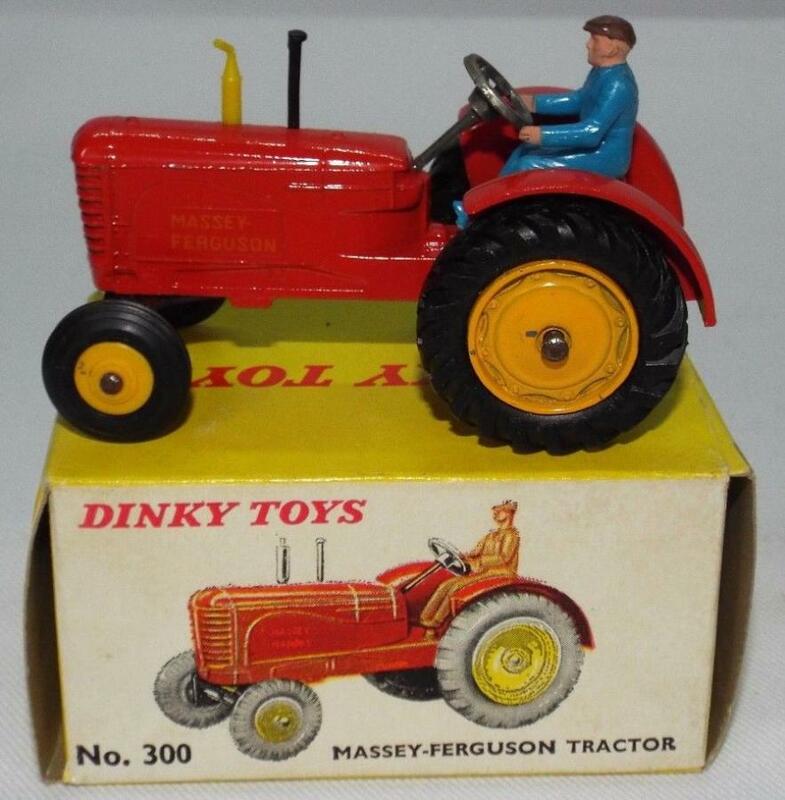 This will undoubtedly have to do with the fact that Meccano Liverpool did not yet have a license to use the new name Massey-Ferguson and apparently this was only arranged in 1966. 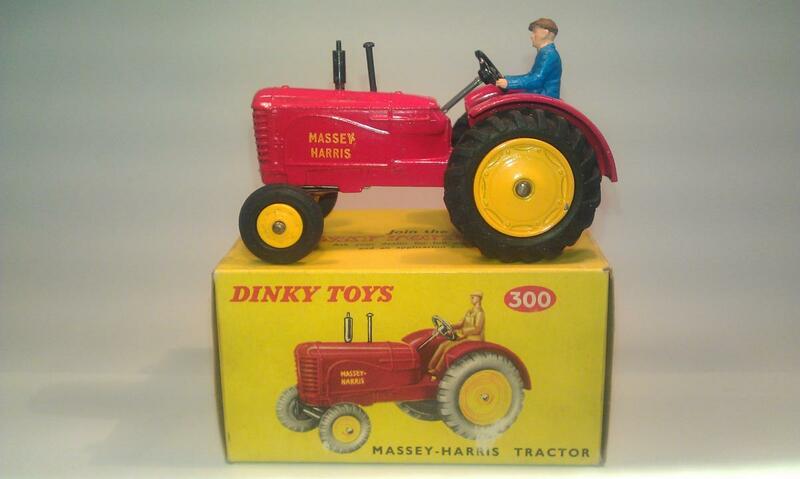 In that transition period indeed DT Massey Harris tractor models were issued through Meccano Liverpool without a brand name on the model. 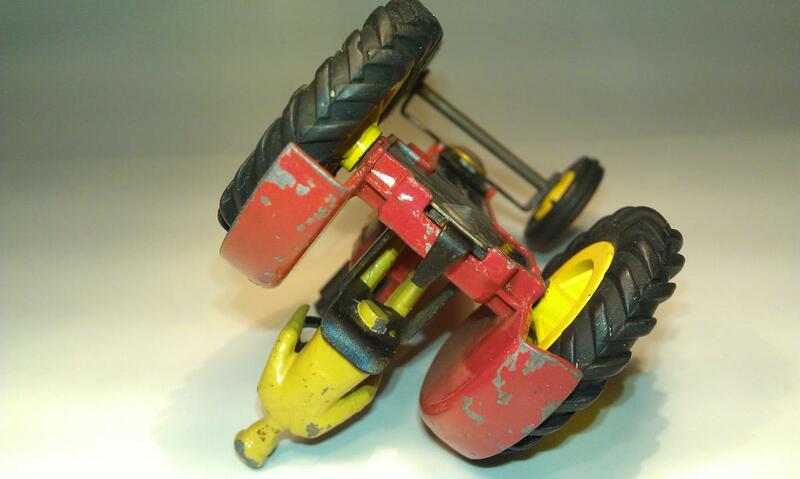 On Ebay, DT Massey-Ferguson models are still for sale without brand name. At the end I show pictures of both DT models: without and with Massey-Ferguson on model. 1st appearance in Meccano leaflet UK 1948. Sales number 27a. 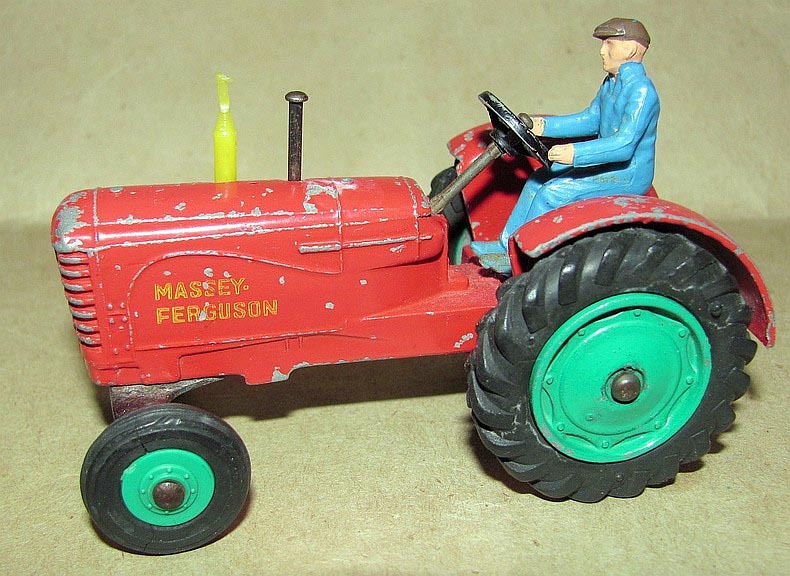 Last appearance of DT Massey-Harris tractor in catalogue UK 1963. Sales number 300. 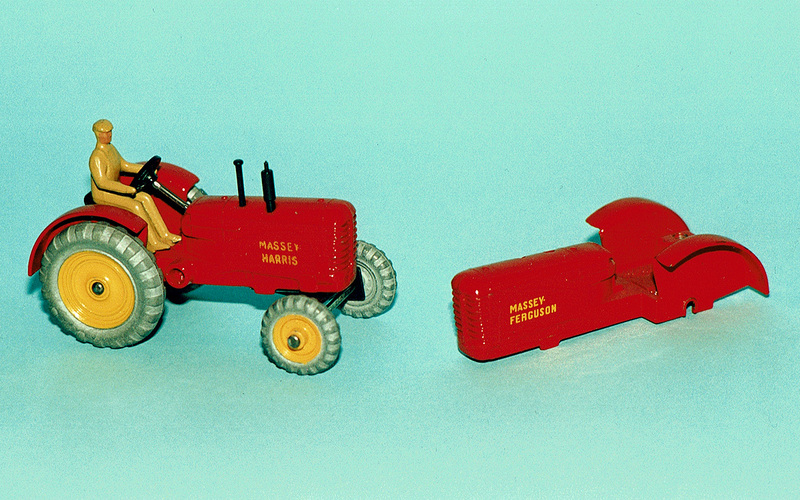 The Massey-Harris tractor models are pictured in the catalogues without brand name in 1964 and 1965. MH tractor in catalogue UK 1964 without brand name on model. MH tractor in catalogue UK 1965 without brand name on model. The brand name Massey-Ferguson is pictured for the first time on tractor models in the 1966 catalogue, 1st edition with sales number 300. It was included in the catalogues from 1966 to 1971. First appearance brand name Massey-Ferguson tractor in catalogue UK 1966 1st edition with brand name Massey-Ferguson on model. Last appearance brand name Massey-Ferguson tractor in catalogue UK February 1971 with brand name Massey-Ferguson on model. Details drawing 27a in GBDT page 178. (At the end in full size). 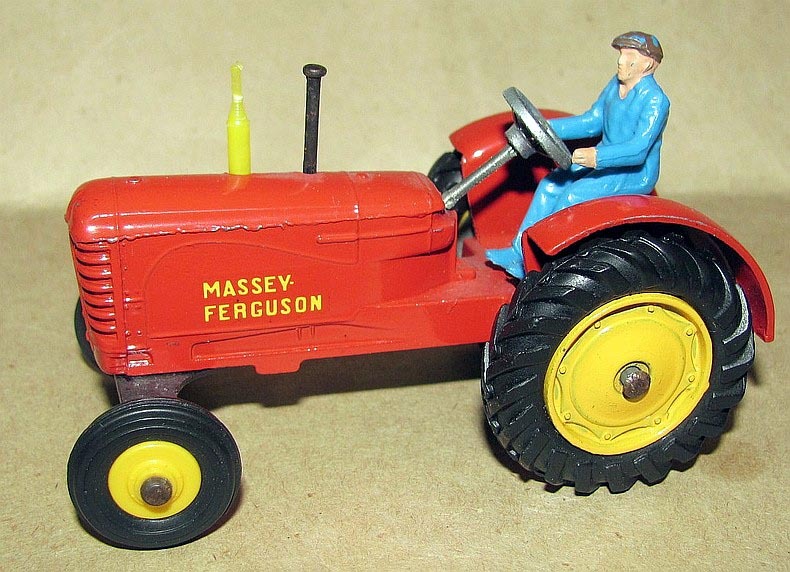 Strangely enough, the brand name Massey-Ferguson, has during his production never been pressed on the base plate. 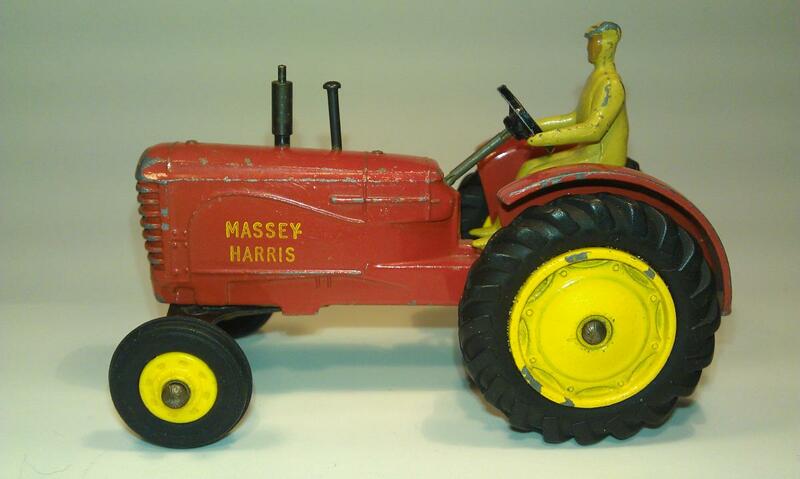 Massey Harris always remained on the base plate. 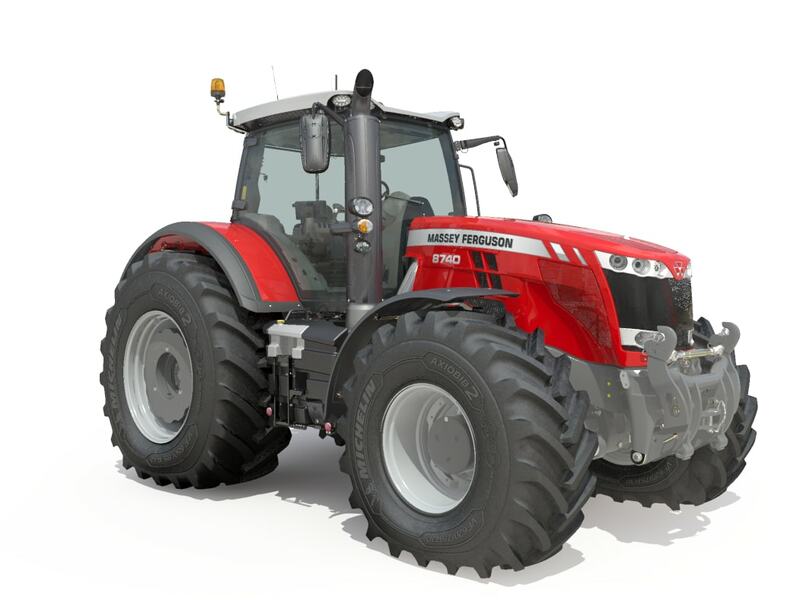 It is strange that the 300 Massey-Ferguson is not included in the PDF library with forum topics. This model has been completely forgotten in the list. Many thanks for the explanation about the trade name and the tractors without marking Harris or Fergusson. It is then a variation and not a factory error. Has one ever seen this variation with plastic front hubs and tan diecast driver ? I doubt that it has ever been made. Yes Jacques, this variation really exists. This MH version is very hard to find, but I found and bought one, albeit in a played with condition, but I like to have this variation. Probably made around 1962 when was switched from metal wheels to the production of rubber tires. 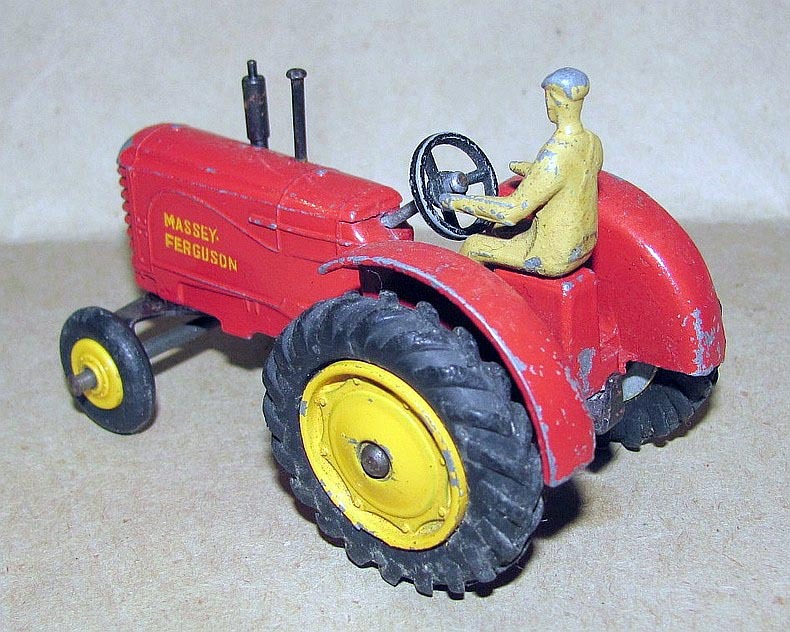 Massey Harris with rubber tyres and tan cast driver on metal split chair. This one is yet still marked Massey Harris and has still the tan cast driver on a metal split chair. The driver is fastened to his chair with the plug method. So my research confirms that the tan cast drivers of the later editions were fastened to the chair with a plug and the first versions with a rivet. I also bought his direct successor, a MH tractor with blue plastic driver on a metal split chair and rubber tires, also still marked Massey Harris. This is the last version marked Massey-Harris. 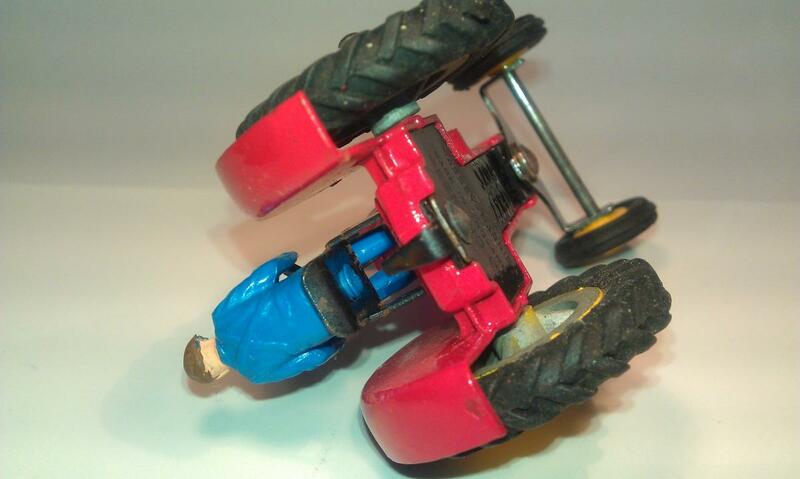 The blue plastic driver of this version looks like also to be fastened to his metal split chair with a kind of stop plug method. This model is in excellent condition with his box and the often lacking inside packing piece. 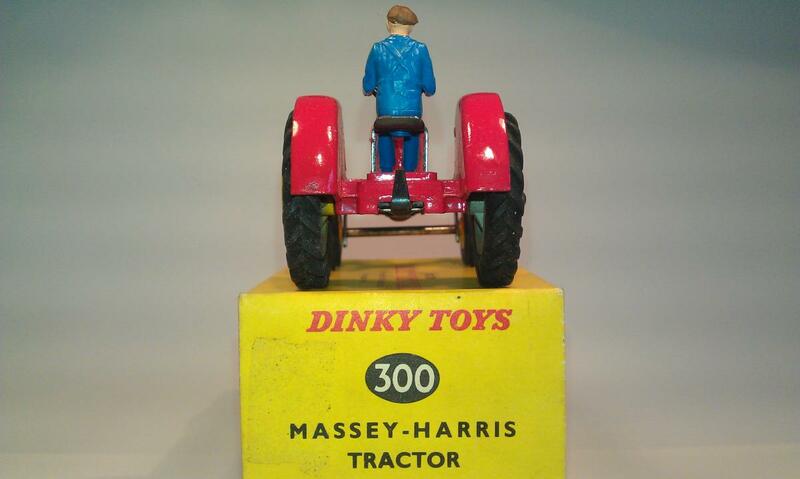 Massey Harris tractor with rubber tyres and plastic blue driver on metal split chair. MH with blue plastic driver fastened to his metal split chair with a stop plug. 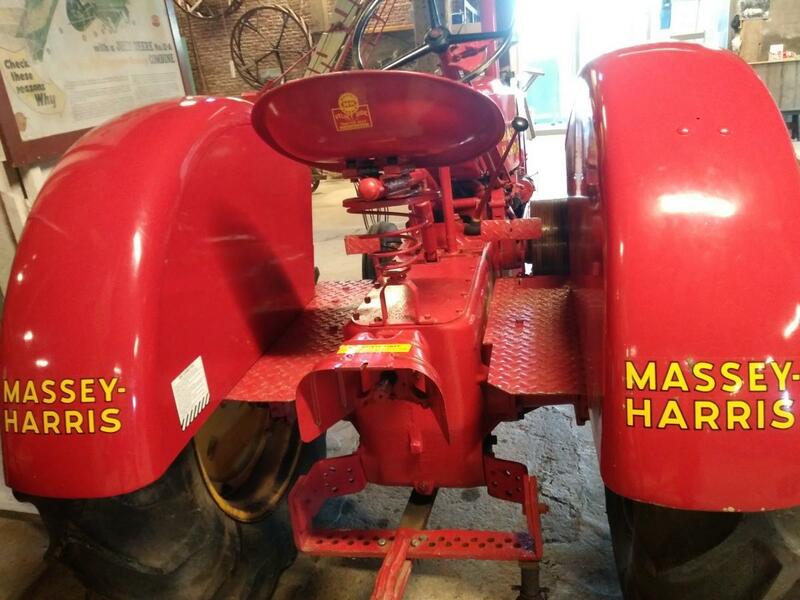 Till now we have seen images of all variations of MH tractors marked Massey Harris. 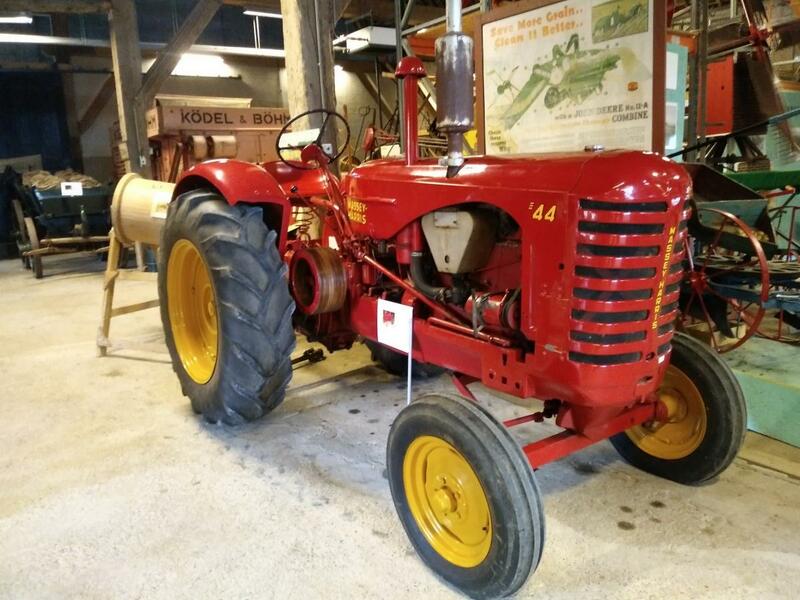 Probably due to the lack of authorization for the new name Massey-Ferguson, in 1964 and 1965 the MH tractor appears without brand name indication. 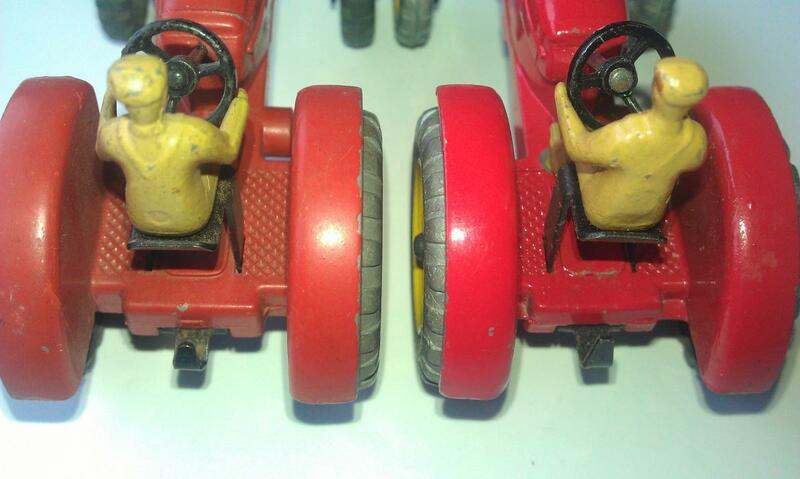 These late Massey Harris tractor models, around the transition period from MH to Massey Ferguson are very hard to find, surely in excellent condition. Only in 1966 the first Massey-Ferguson tractor appears with the brand name Massey-Ferguson and remained in production until 1971. A very enjoyable and welcome contribution Jan. The variations are fascinating and I am persuaded that a nice example or two would enhance my collection. Hi Ron. In your very interesting and valuable contribution number #1 you are talking about: "There are some variations with the base finish, but this is not the subject here". Because I am collecting variations of this tractor, I am very curious about the variations with the base finish that you mean. Can you explain and show pictures of it? I used the reply button under your contribution # 1 but it fails every time and my reply becomes number # 13, so I do not know if you have received a notification of my reply. Boy this topic has gained a life of it's own. I will have to check on what I meant by the comment about the base finish. It was three years ago that the original post was made. Many thanks for all the information that you gave us about all the variations. Last week I visited an agricultural museum on the island Tiengemeten. Tiengemeten is a small natural island of approx. 1000 hectares in the Haringvliet in the province of South Holland in the neighbourhood of Rotterdam. In the past, the agricultural area on the island was managed by farmers, but now it is managed by a nature conservation organization (Natuurmonumenten) and can only be reached on foot or by bike with a ferry. The tractors from the past were completely open and had not any protection against cold, wind and rain in comparison with the tractors today which have a closed cab, much more power, possibilities, electronic features and comfort. I show a part of the text from Meccano Magazine of June 1948, in which the reproduction of model 27a from Massey Harris 44 is explained. Museum catalogue card Massey Harris 44 with description in Dutch. This tractor is equipped with a benzine / petroleum engine. The engine must first be started on gasoline (benzine) and when the engine is warm, must be switched to petroleum - (The English translation gives me problems). - Petroleum was cheaper than benzine. 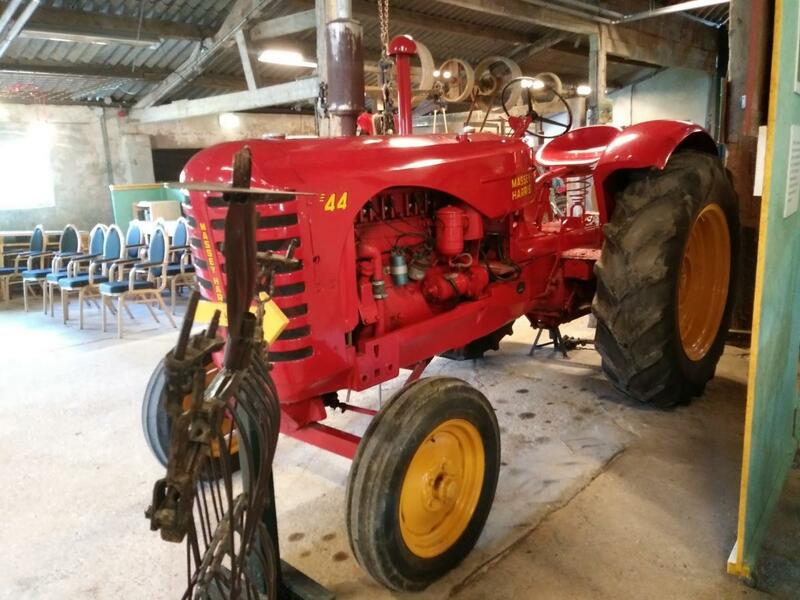 I will show you pictures of this real Massey Harris 44 from 1948 and the latest produced real Massey Ferguson 8740S from 2018. The Massey Harris brand name changed to Massey Ferguson in 1958 and is the most widely sold brand of agricultural machinery in the world. 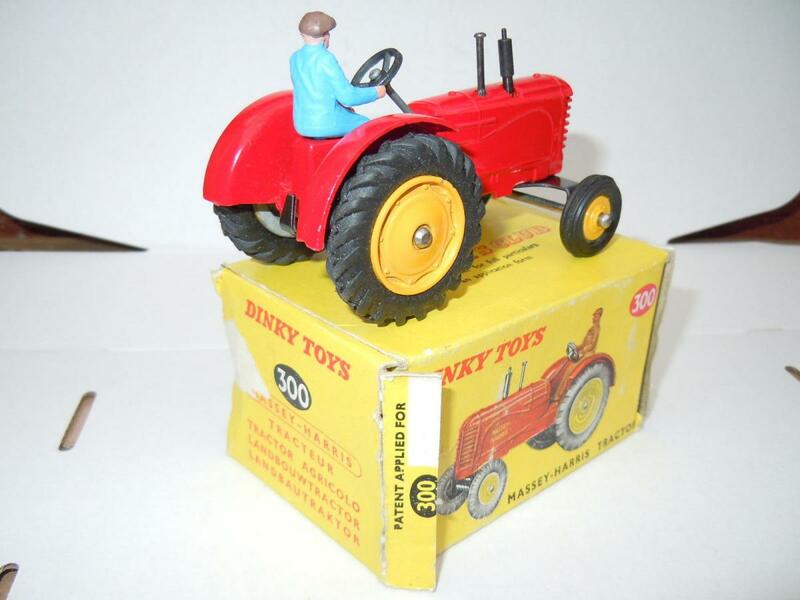 Jan—A most interesting writeup on our Dinky Toys tractor, with wonderful photos and history. 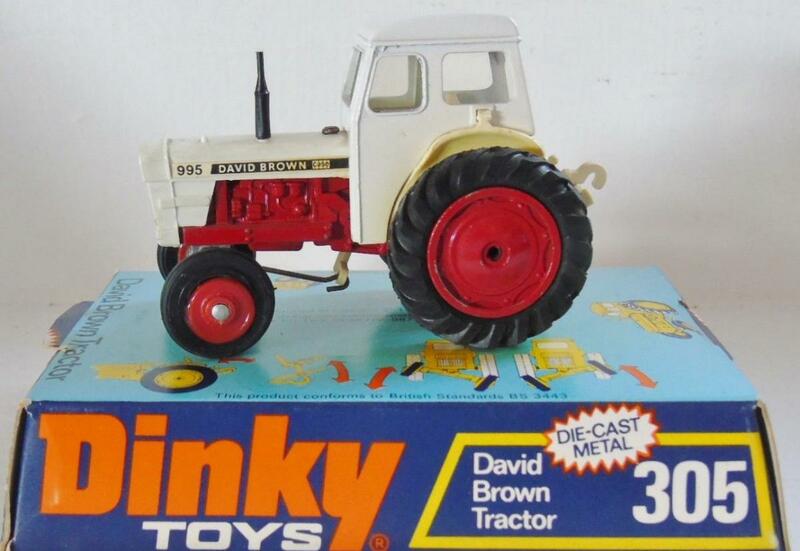 A question.....the Dinky model shows those side panels on each side of the engine, while every photo I have seen of the real tractor always shows those open. Did Meccano simply leave those in place so as not to have to replicate the engine, which would have complicated things? Terry, indeed it is striking that Meccano Liverpool has closed the engine compartment of the Massey Harris 27a (1948-1966). You simply miss the contours of the engine in the model. 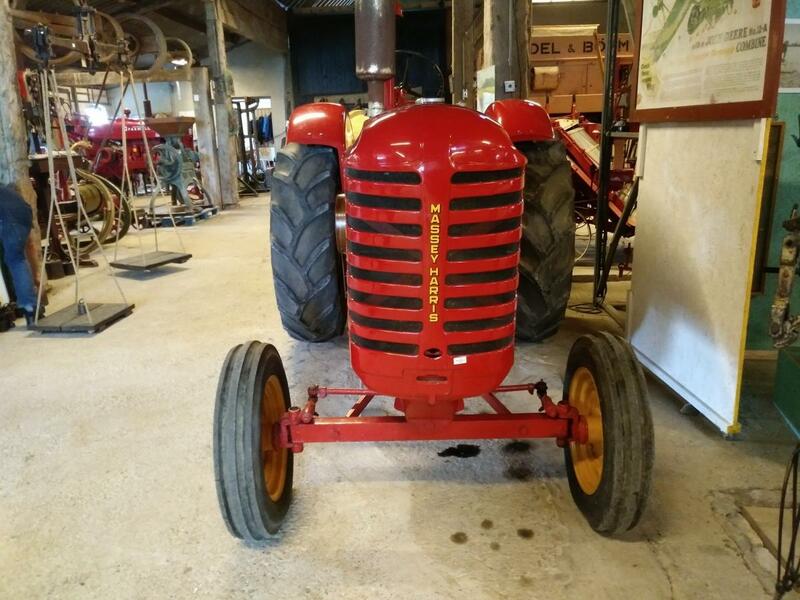 By the 301 Field-Marshall Tractor (1953-1966) they also closed the engine compartment, while by the later 305 David Brown Tractor (1965-1967) the engine was reproduced in the model. See pictures. If you turn the 305 model around you clearly see the 2 halves of the mold, but then there is already a lot of plastic added to the models. I think that they have closed the engine compartment of the early 27a en 27n from cost savings, but perhaps also have developed a different process over the years? Maybe Jacques can say something about that. 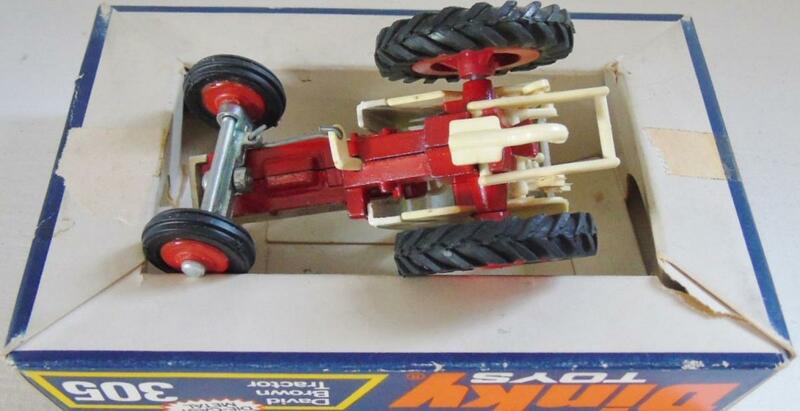 Meccano has also closed the engine compartment of the Blaw-Knox bulldozer until they produced the plastic version. 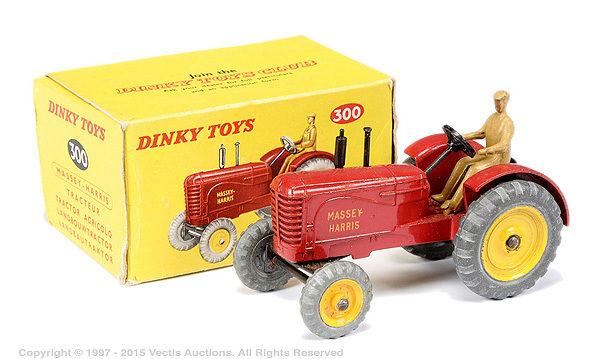 When the Massey Harris and the Blaw-Knox were issued in 1948 and 1949 respectively, the competition against Corgi and others had not started and Dinkys were considered more like toys than accurate replicas of the prototypes. At that time Dinkys were simple and nobody cared about the accuracy. Later, when the competition was runing Meccano improved the Bulldozer in 1963 (plastic version) and replaced the Massey-Harris by the David Brown 305 and Leyland 308 tractors in 1965 and 1971. All these models had now open engines. Yes, those were the days. I have had to sel it.